Baranovichi ( Belarusian: , Lacinka: Baranavicy, Baranavichy, Baranavichy; Russian: , Polish: , Yiddish: , Baranovich), is a city in the Brest Region of western Belarus with a population (as of 1995) of 173,000. It is a significant railway junction and home to a state university. It was also the center of the Baranavichy Voblast between 1939-1941 and again between 1944-1954. Baranovichi (Listeni/b??r? ?n?v?t?i?/; Belarusian: ??????????? [ba?ranav?it?i], Lacinka: Baranavicy, Baranavichy, Baranavichy; Russian: ?????????? ?, Polish: Baranowicze, Yiddish: ?????????? ?, Baranovich), is a city in the Brest Region of western Belarus with a population (as of 1995) of 173,000. It is a significant railway junction and home to a state university. It was also the center of the Baranavichy Voblast between 1939-1941 and again between 1944-1954. The village of Baranowicze, as it was originally called, was first mentioned in 1706 as a private property of a Polish family named Rozwadowski. In the late 18th century, in the effect of the Partitions of Poland, the town became part of the Russian Empire. During Russian rule it was part of Navahrudak uzeyd, which was part of firstly in Slonim Governorate between 1795 and 1796, Lithuaina one between 1796 and 1801 and Grodno one between 1801 and 1843 before passing to Minsk one. In the 1870s the locality became an important railway junction, on the crossing of the Warsaw-Moscow and Vilnia-Lviv lines, and was renamed Baranovichi after the Baranovich family. Soon the village started to grow, and by 1883 it became a town of almost 2,000 inhabitants. It was a volost center in Navahrudak uzeyd of Minsk Governorate. By 1897 the population of the town had risen to 4,600 inhabitants (ca. 50% Jews). 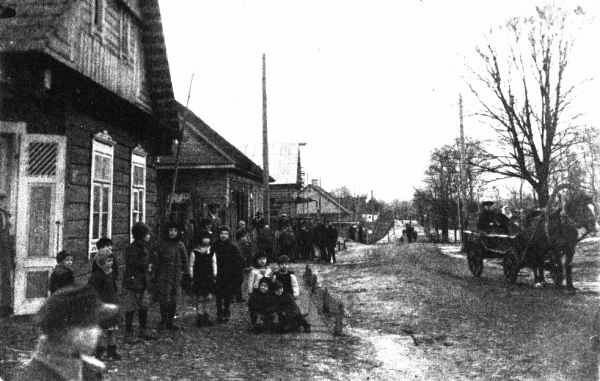 At the beginning of the First World War it was chosen as the location of the Stavka, which was removed to Mogilev in 8 August 1915 due to German occupation.